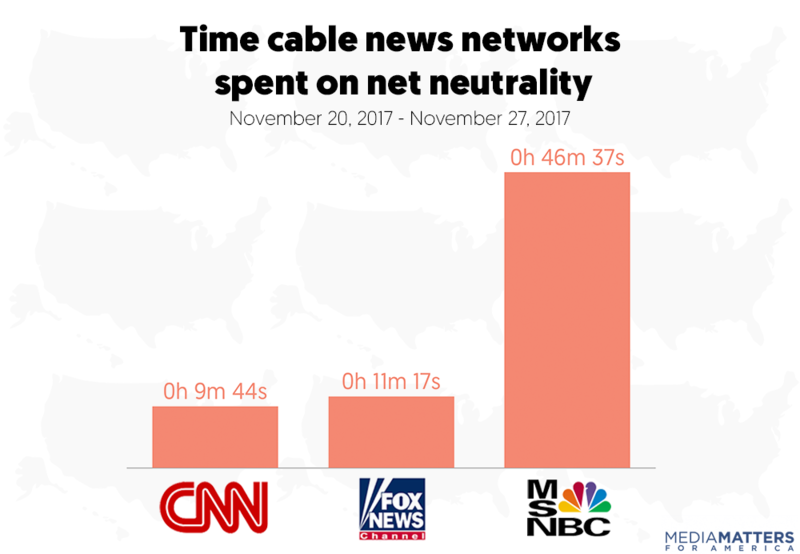 The broadcast networks’ morning news programs, nightly newscasts, and Sunday political talk shows covered net neutrality for a combined five minutes. Since November 20, NBC has not covered net neutrality at all. A Media Matters review of morning news, evening news, and Sunday political talk shows on the three major broadcast news networks revealed that NBC has yet to report on this story. CBS spent about four and a half minutes on the story while ABC gave net neutrality just 25 seconds in a single news brief on World News Tonight with David Muir. Media Matters searched the Snapstream database of television video transcripts for any mentions of “net neutrality,” "Federal Communications Commission,” or “FCC” from November 20 to November 27, 2017 on the three broadcast news networks -- ABC, CBS, and NBC -- and the three major cable news networks -- CNN, Fox News Channel, and MSNBC. We also searched the Nexis transcript database for the same terms. Since November 23 was Thanksgiving, some networks altered their regularly scheduled programming on that day. Correction: Media Matters originally reported that CBS ran stories totaling approximately two minutes. The correct timing for CBS is four minutes and 34 seconds. We regret the error.